Happy Wednesday! 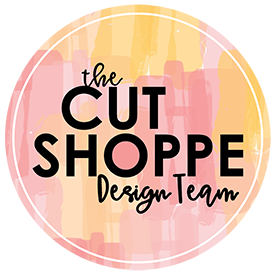 I’m back today with a new layout for The Cut Shoppe. Today’s layout is Halloween themed. Surely I’m not the only one still scrapbooking Halloween, right?! Halloween is most definitely my favorite holiday to scrapbook and I haven’t been able to bring myself to put away my goodies just yet! For today’s layout I’m using the Ghost Town Digital Collection, the Happy Halloween Wood Veneer Set and the Tangled Web Background Cut File. I started with a 12×12 pattern paper from the Ghost Town Digital Collection as my background. I then went through my stash to find Halloween goodies that match the photos from our last trip to Disney World when Aidan met Jack & Sally. I used a chipboard banner piece from the Crate Paper After Dark Collection, a spiderweb flower from Recollections, and a couple chipboard pumpkins from Simple Stories Frankie and Friends Collection. I wanted to back my photos but didn’t want to use pattern paper so I cut the Tangled Web Background Cut File, sectioned it into pieces and tucked the webs behind my photo. For my title I used the ‘Hey Jack’ from the the Happy Halloween Wood Veneer Set, but I wanted to pair it with the word ‘Skellington’. I knew I would be using black alpha stickers from Elle’s Studio so I painted the ‘Hey Jack’ black with acrylic paint so it would match. I added a few other stars and the word ‘Boo’ from the same wood veneer set. I wanted to add a few extra wood veneer stars so I grabbed a few tiny stars from my Studio Calico wood veneer stash. I also used my We R Memory Keepers Typecast Typewriter to add A LOT of journaling! HA! Meeting Jack & Sally was something that was very exciting for Aidan and I wanted to be sure I documented it in detail!! Here’s a process video showing how this layout came together! Thanks so much for joining me today! !